Doc imploring our heckler to do better (via AP). Note: That’s not what is actually happening in this picture. I write “attempted” because any nine-year-old could come up with better heckles than this guy. First, “you’re not that good” is an incredibly weak insult, and it isn’t particularly true about Redick. 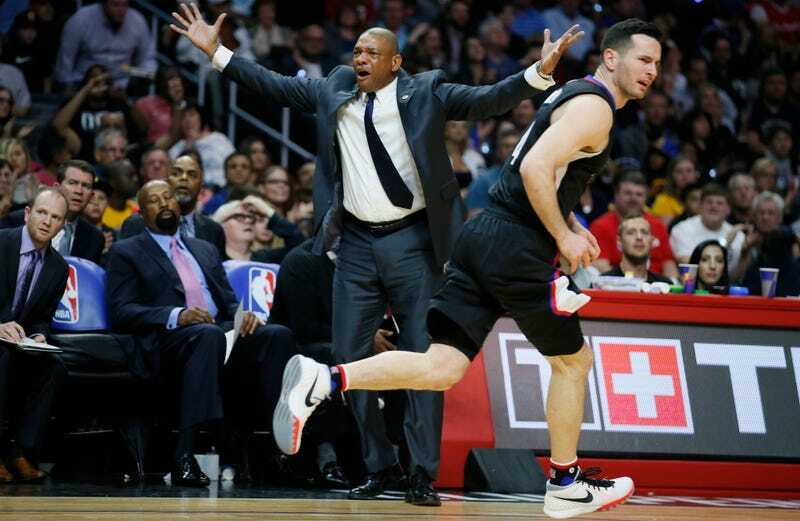 And then, as evidence of the fact that Redick isn’t very good, the heckler pointed to the fact that the Clippers lost by 43 points Monday night. Except, the Clippers didn’t play Monday night, and it was the Pistons who lost by 43 points to the Wizards. Luckily for the Spurs, their game was much, much, much better than their fan’s, and they beat the Clippers by 21.